The Profit Pillar of Six model will help you in taking a complete inventory of your businesses key areas regarding your marketing. Understanding these key areas allows you to pinpoint your businesses strengths and weakness, along with remedies to improving them. 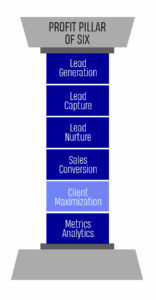 Lead generation is the lifeblood of your business. 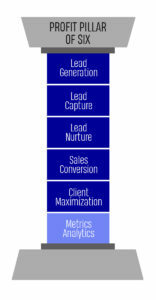 Without leads there are not sales. 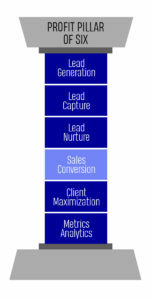 Lead generation is very important in building a viable sales funnel. Are you getting new customers reaching out to your business for help with their problems? If not, than the solution is better lead generation. 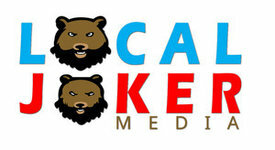 Lead Capture is the sector made more prevalent with the widespread use of internet. 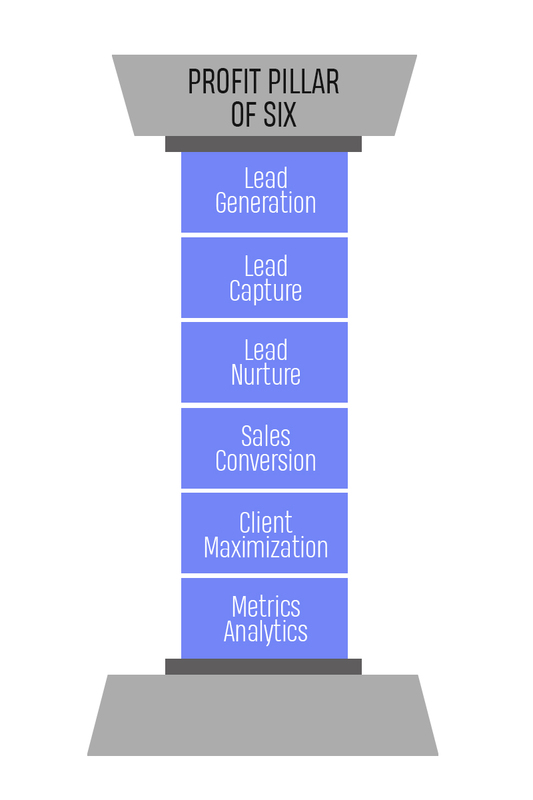 Even so, many businesses do not have a lead capture system and if so aren’t using it properly. 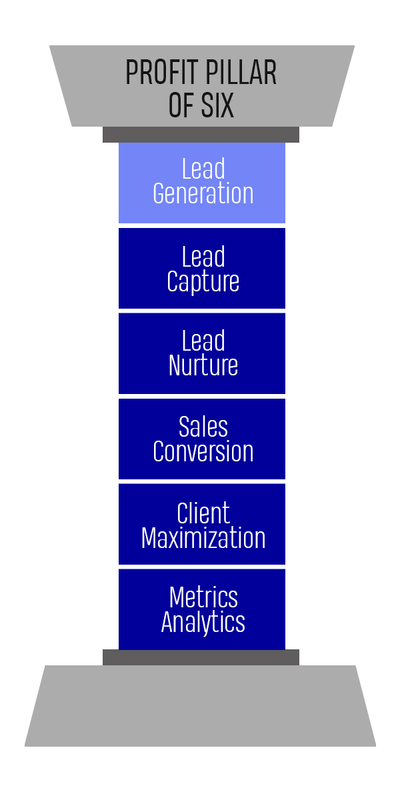 An effective lead capture system will provide your business with the right amount of leads to fill your pipeline for further nurturing. Lead nurturing is an art that many business severely neglect in their marketing system. Leads are the lifeblood of a truly profitable business, almost to be treated as family since their are a part of your business. Many businesses do appreciate their leads and do not nurture them properly with generous content and genuine communication. 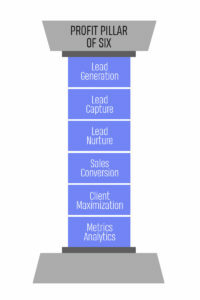 A proper lead nurture system helps to build authority, trust, and credibility to help increase your sales inquiries and conversions. How many shots you’ve taken matters. How many shot’s you’ve made matter even more. If your marketing campaigns are not converting properly then you are not making sales. Period. 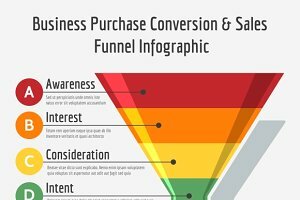 The purpose of building your sales funnel is maximize conversions. Your business should have the proper elements in place including reputation management, social media presence, and solid leads nurturing to increase sales conversions. Your best customers are your repeat customers. 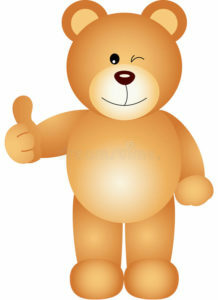 Many studies show that it is far more profitable to sale to a returning customer than to a new customer. Building customer loyalty is a highly coveted practice of it’s own. Many business rely heavily on customer loyalty and word of mouth but a better approach is by combining all of the sectors for a more balanced marketing system. Men lie… Women lie…. Say what you want but the numbers don’t lie. There’s a reason why billions of dollars is spent on data-mining research. 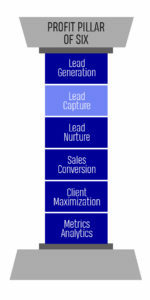 Tracking metrics helps you to determine what campaign is performing best and for which reasons. The goal is always to get the most bang for your marketing dollars. What metrics are you tracking each month to determine what is working and not working in your sales, marketing, and operations ? How are you measuring your marketing to determine if you are having an increase in revenue, decrease in expenses, or to improve your profitability? The Profit Pillar of Six will help you and your business no matter what knowledge you have or lack. 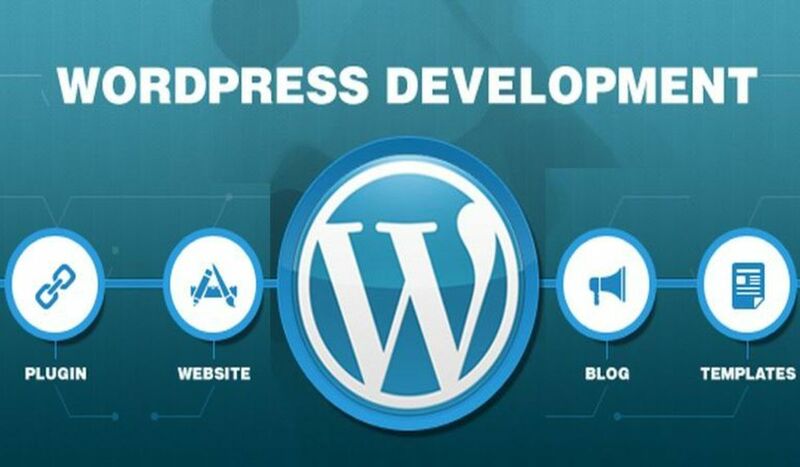 It will help you bring together all the information you have most likely been acquiring from all over the internet and realize how it all goes hand in hand in your business. Understanding each sector of the pillar and the role it plays will continue to help you improve the strength and weakness in your business. Stay tuned for the future articles in the Profit Pillar of Six Series as we will be diving deep into each sector…..